Since our discovery of Letting Up Despite Great Faults in 2012, this Austin-based band has been under the watchful eyes and ears of the lo-fi shoegaze fanatics in our Nest. Letting Up appeals to champions of the DIY mentality, folks who root for the underdog, and those who love to say “I told you so.” With every self-produced and self-released album, the band manages to provide listeners with unadulterated evidence as to why we all should be avid Letting Up believers. The band’s third full-length album Neon is no different. “Wrapped,” the first single off Neon, features Mike Lee and Annah Fisette’s sweetly harmonized vocals in the foreground on top of pop-inspired electro melodies rather than buried in the dreamy haze of lo-fi distortion. Fisette plays a much larger vocal role this time around taking on the lead vocals for “Bishop” which adds a new and softer dynamic to Neon since a majority of the vocals are Lee and Fisette or solely Lee. A purposeful lean in the direction electro-pop is evident throughout the album. 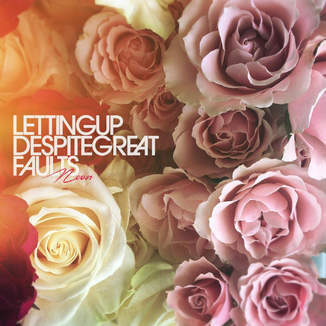 Letting Up’s sound is crisper but still thrives in the realm of ’90s nostalgia (“Gravity”) with a shimmering reflective quality in guitars that effortlessly soar (“Secrets” and “Ride”). There’s a quiet inkling about Letting Up that persistently nudges you for attention. It’s something that you can’t quite put your finger on until you listen to one of their albums from start to finish – then the inkling becomes quite evident. It’s heartwarming adoration.